Action items are the most important outcome of a meeting. 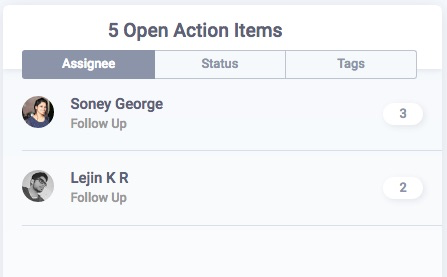 To create action items, just type them out in the editor and mention an assignee with @assignee. You can specify due dates and tags which are helpful in tracking and classifying the Action Items. MeetNotes allows you to create Action Items as you take notes, no need to shift focus outside editor. 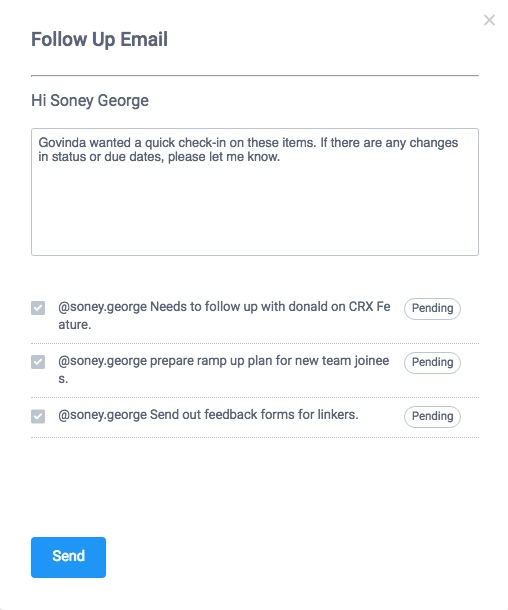 Just type @assignee on any line to convert it to an action item. A action status label button is shown beside it and its assigned to the mentioned person. You can mention more than one person in an action item. In that case, the first one mentioned is assumed to be the owner of the action item. Action Items can be tagged. The examples above are tagged with #Escallation and #Onboarding. Due dates are a special type of tag. If you type #friday its assumed as a due date for next Friday. You can also type a full date e.g. #5/9 and it will be parsed. Expected format for due dates is mm/dd. If entered date is invalid, MeetNotes tries to be smart and uses it the other way around i.e. dd/mm. But first preference is mm/dd, thus 09/05 will be interpreted as 5th September. Action item status can be updated from the right section, which lists all action items according to the attendee. The total number of open action items and the number for each attendee is displayed. To view status of action items, click on the number beside the attendee's name. You can update the status from here. You can check in with your colleagues on the status of action items. Click on the follow up link next to person you want to follow up with. 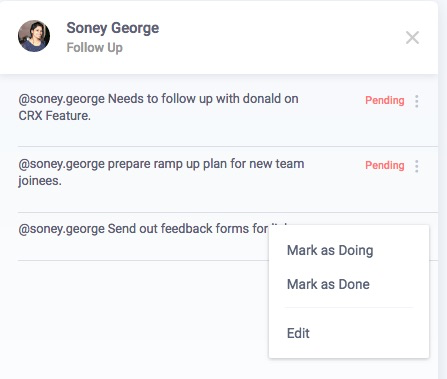 Once the follow up dialog appears select action items for which you require follow-up. Follow-up email will be sent to the respective attendee. This is how you can add. manage and follow-up on action items and to-dos from a meeting. Action items ensure that we are able to execute what was discussed in the meeting and achieve the planned outcome.